Black Friday & Saturday SALE! Nov. 23-24 ONLY! 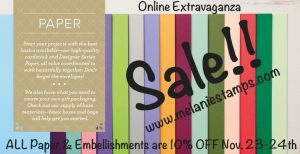 All Paper & Embellishments are ON SALE!!! 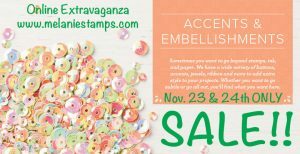 Nov. 23-24 ALL Paper & Embellishments are on sale. CLICK HERE to see the selection of items and their discounted pricing. Previous postWeekly Wrap Up! ~ Dashing Deer Bundle ~ Quick and Easy Card to the Rescue!! !